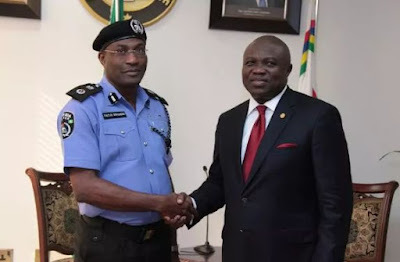 *Ambode Presents more equipment to RRSLagos state governor Akinwunmi Ambode has increased to N10 million the death insurance benefit for police officers, who die in active service in the state. Ambode announced this in his office yesterday after he was presented with two awards recently won in South Africa by the Rapid Response Squad (RRS) of the Lagos Police Command. He said his administration was raising the stake of death insurance policy from N1million to junior ranks and N2million to senior officers to N10 million for all categories, no discrimination. Promising that his administration would stop at nothing to ensure the safety of all citizens, he said security and safety of the people remains one of the focal objectives of his administration, and that government would continually embrace measures to motivate and encourage officers. The RRS, at the awards presented by Security Watch Africa (SWA), emerged the best anti-crime police squad in West Africa. The RRS Commander, Olatunji Disu, an Assistant Commissioner of Police, won the award of most outstanding police operational officer in Africa. The government also bagged the award as the best security and most safety conscious state in Africa. Ambode congratulated the commander and men of the RRS for the feat, saying that the people were appreciative of the gallant efforts of the unit at reducing crime rate, especially in the last one year. He praised the Commissioner of Police, Fatai Owoseni, for his purposeful leadership, saying it was evident that the police were performing creditably well. Alluding to the need for increment in the death insurance benefit of officers, the governor recalled the recent loss of some officers in active service, adding that while government was not praying for a recurrence, it was appropriate to reasonably reward the family of any officer in the event of eventual death. Ambode presented three patrol vehicles and 45 power bikes to the RRS. He also directed the police to ensure hitch-free yuletide celebration across the state.